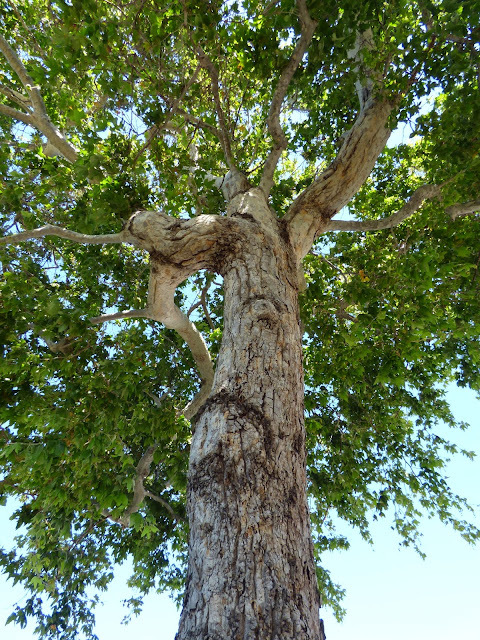 For more than a century and a half this venerable sycamore tree has stood near the edge of the Malibu Lagoon. It has survived fires, floods, and change, including the construction of Pacific Coast Highway. Now, developers propose chopping it down as a way of accommodating more traffic and more development in the Civic Center area. "He may have meant that the way men were living and working in the twentieth century was increasing in barbarity at an alarming rate, and that the loud demonstration of this in the streets of Oxford might serve as a warning that it is not possible to preserve for long an oasis of sanity in a desert of unreason by mere fences, without actual offensive action (practical and intellectual). I fear he did not. "In any case, the expression 'real life' in this context seems to fall short of academic standards. The notion that motor-cars are more 'alive' than, say, centaurs or dragons is curious; that they are more 'real' than, say, horses is pathetically absurd. How real, how startlingly alive is a factory chimney compared with an elm tree: poor obsolete thing, insubstantial dream of an escapist!" 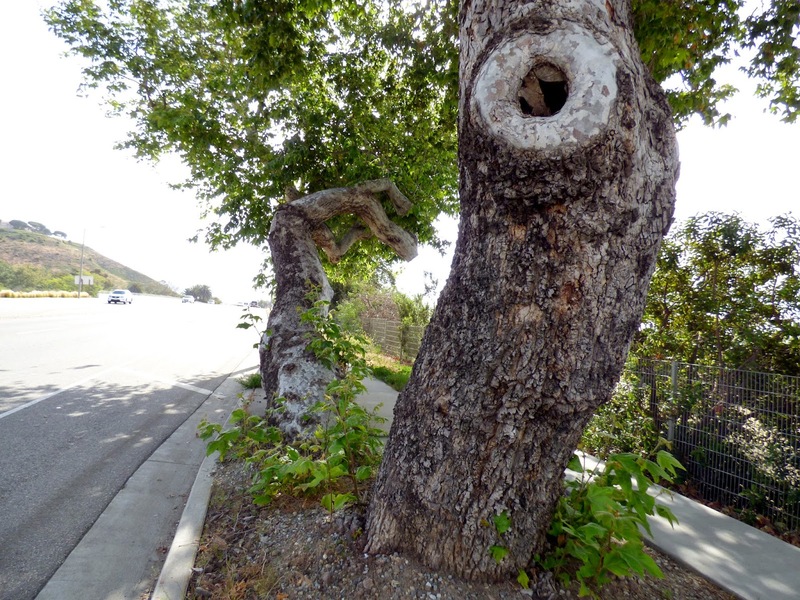 I like to think the Professor would have harsh words for a certain developer’s plan to remove an ancient sycamore tree from the side of Pacific Coast Highway, where it has grown since before the road was built. Everyone who has ever driven through Malibu has driven past that tree. I’ve been reading the supplemental Environmental Impact Report for the road widening project that is part of the La Paz shopping center development plan. In order to build the new 112,000 square-foot mall on undeveloped land next to the Malibu Library, PCH has to be widened to accommodate a longer/bigger turn lane for Cross Creek Road. Here's a rendering of the La Paz shopping center, landscaped in the illustration not with native trees like sycamores but with tropical coral trees and jacarandas. Real Estate advisor firm for the project Richard J. Hill and Co. states on their website that "We noted with great interest annual retail rental structures [in Malibu] exceeding $200.00 a square foot and rent to sales ratios that were non-economic." 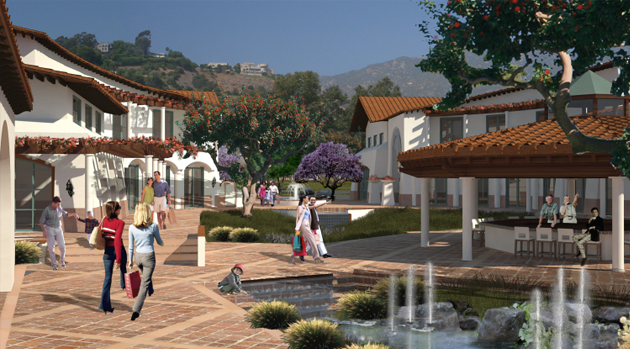 The firm, whose job is described as "to define and quantify the site’s retail potential, opportunities and challenges," also states: "The initial analysis defined Malibu as a cultural gateway, iconic brand showcase, and a portal into the lives of brand apostles in the entertainment and sports industries." This mission statement is at odds with the City of Malibu's, which states: "Malibu is a unique land and marine environment and residential community whose citizens have historically evidenced a commitment to sacrifice urban and suburban conveniences in order to protect that environment and lifestyle, and to preserve unaltered natural resources and rural characteristics." Chopping down a historic tree to make way for commercial real estate isn't a great way to "preserve unaltered natural resources." This disconnect perfectly demonstrates why the vast majority of Malibu voters endorsed Measure R, which restricts the number of chain stores and will require approval from the voters for all future large development projects. EIRs are, unfortunately, a kind of game. Instead of being a tool to identify and solve environmental issues, all too often they end up being a collection of lame excuses. The environmental community likes to say the developer hires a biologist to go out and sit in their car with the windows up, their eyes closed ,and their fingers in their ears, who will then report that they didn’t see or hear anything. The Millennium project in Hollywood is a great example of this sort of “we didn’t see it so it isn’t here” philosophy. The developers proposed building two massive apartment towers on a major earthquake fault. You can read about it here. 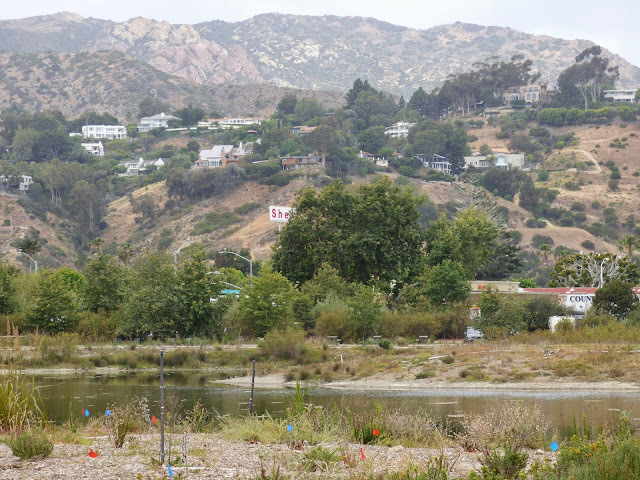 It’s not usually quite that bad in the Malibu area, where the California Coastal Act and the local coastal program developed as a result of it, temper to some degree all projects. Although one recent EIR used a special concern plant and animal species list from another part of California—a handy way of making sure you don’t find anything on the list. If one goes to see “Attack of the 50-Foot Woman," one is expecting to see a movie about a giant. When one reads about a “41-inch tree,” the visual that is conveyed is a tree shorter than the average adult human. In this case, the measurement is intended to indicate not height but diameter. However, one suspects that the authors of the EIR wouldn’t mind in the least if it makes the tree seem diminutive. Here's the "41-inch tree." It would be even more massive, but several large branches and a third stem have been removed over the years, and it has apparently been topped more than once. It stands between 50 and 60 feet tall today, but appears to have a larger canopy in old aerial photos. It reminds me of the comic book character Hellboy—the sawed-off branches and trunk resemble his horns and stone arm, and the whole shape is rather similar—maimed, but tough and and enduring. 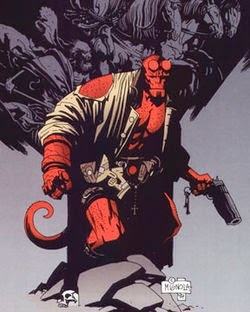 Mike Mingola's iconic comic book character Hellboy is almost indestructible and nearly immortal. Unfortunately, the Malibu sycamore tree is not. 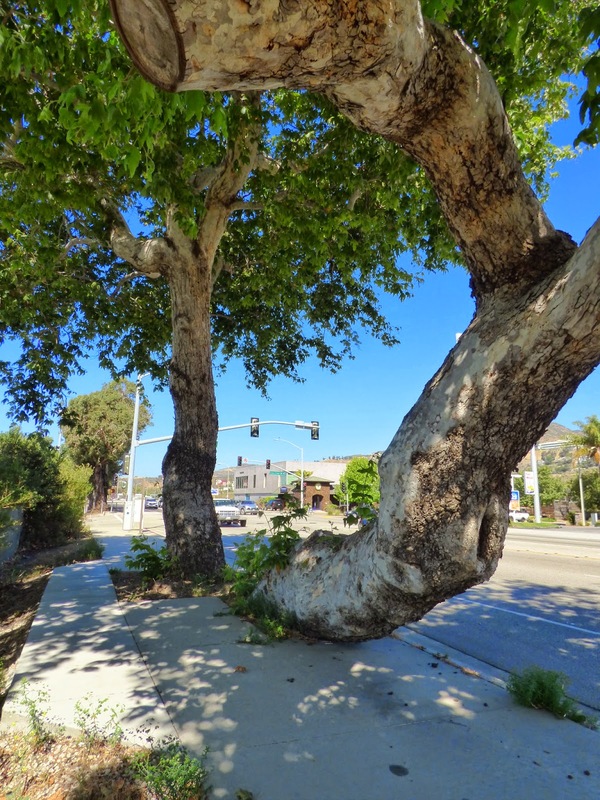 These improvements would require the removal of one (1) existing 41" sycamore tree located southeast of the Pacific Coast Highway/Cross Creek intersection and five (5) existing eucalyptus trees located southwest of the Pacific Coast Highway/Cross Creek intersection. I don't see the word diameter in there, do you? It is mentioned later, once, on page four, but the initial and almost consistent omission throughout most of the document makes it sound like a small tree. Here's a look at the "41-inch" sycamore from the east side. The La Paz EIR does not include a report on the tree, but it appears to be thriving and is probably good for least another 100 years, given the chance to live. The EIR never mentions that there are two stems of nearly equal girth. What that 41-inch diameter measurement means is that each stem of this tree has an almost 11-foot circumference. Diameter = circumference divided by pi: it’s the distance through the trunk, not around it. Describing this tree as a “41-inch sycamore” is disingenuous. The developers propose to replace this tree with 10 one-gallon seedling trees. The problem is, none of these trees will replace the existing giant in our lifetimes, because the tree that is scheduled for destruction is old—a true heritage tree. It's going to take a long time for a one gallon seedling to replace the old sycamore tree, and once the old tree is gone, there won't be anything to screen the view of the Civic Center development, including the gas station sign, from the visitors at the Malibu Lagoon. Using the US Forestry Service’s formula (using stem diameter, height, canopy dimensions and the estimated growth rate for the species) to determining the age of a tree—a challenge because one stem grows horizontally, yields a result that indicates this tree is around 160 years old. Most longtime locals are familiar with this vintage postcard image from the late 1930s/early 1940s, but if you give it a second look, you can see our friend the tree—visible right before the bridge. This image is from the Eric Wienberg Collection of Malibu Matchbooks, Postcards, and Collectables, at Pepperdine University, and you can see it in much more detail on the Pepperdine site. The date is an educated guess, based on the size of the tree and the known growth rate of the species. If it’s accurate, this tree has survived fires, floods and the construction of the highway. It would have sprouted during the 1850s, the era of the California gold rush. The Malibu Rancho was still a Spanish land grant property in the 1850s, belonging to French settler Leon Victor Prudhomme. 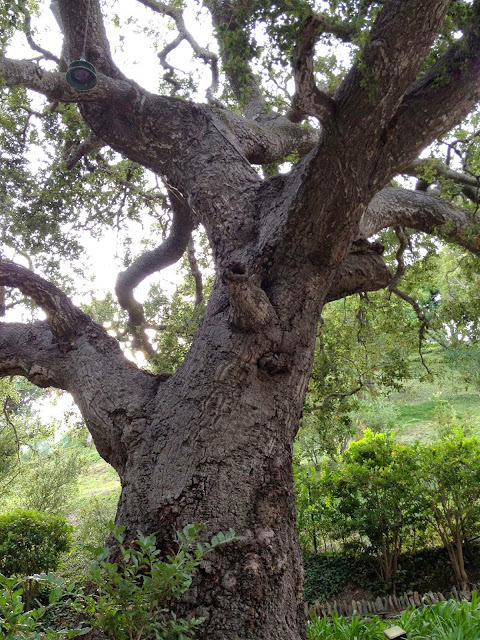 This tree would have been fully grown when Frederick Hastings Rindge purchased the rancho in 1892. When PCH was constructed in 1929, it may have already been nearing the century mark. 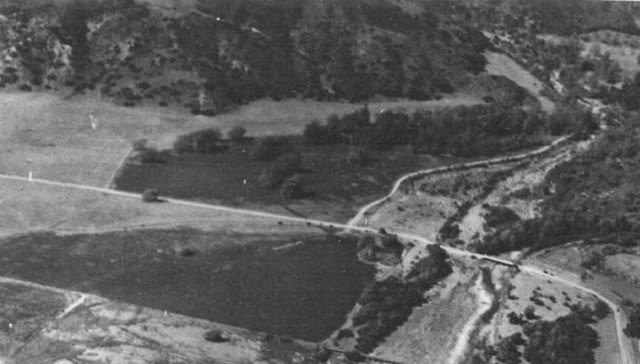 The lone tree slightly to the left of center at the bottom of the photo is our sycamore in 1924, before the highway was constructed. You can view a larger version of this aerial photograph at the Adamson house archives. 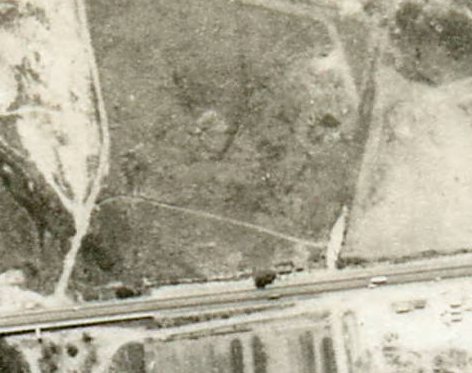 The tracks for the Rindge railroad are visible where PCH is now. One thing that can be documented beyond the shadow of a doubt is the presence of a large tree in that location in aerial photographs. The oldest aerial photo I could find is from 1924, shown above, but one can track the tree through the decades at the UCSB aerial photography archive, beginning in 1929, the year PCH was constructed. The Civic Center area in 1947, long before it was a "civic center." 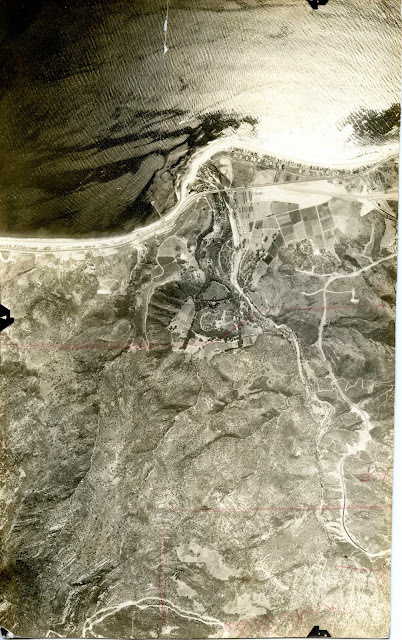 This fantastic aerial photograph is also preserved in the Pepperdine University digital archive. Here's a close-up, showing the tree long before there was a Cross Creek Road. The photographer was shooting towards the lagoon, which is why the tree is on the "wrong" side of the highway. 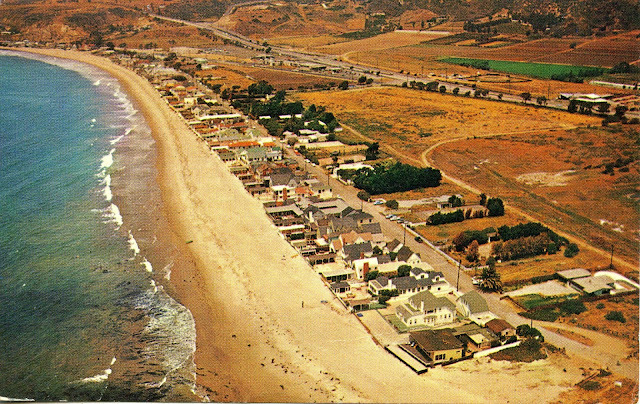 Malibu has a dismal record on historic preservation. 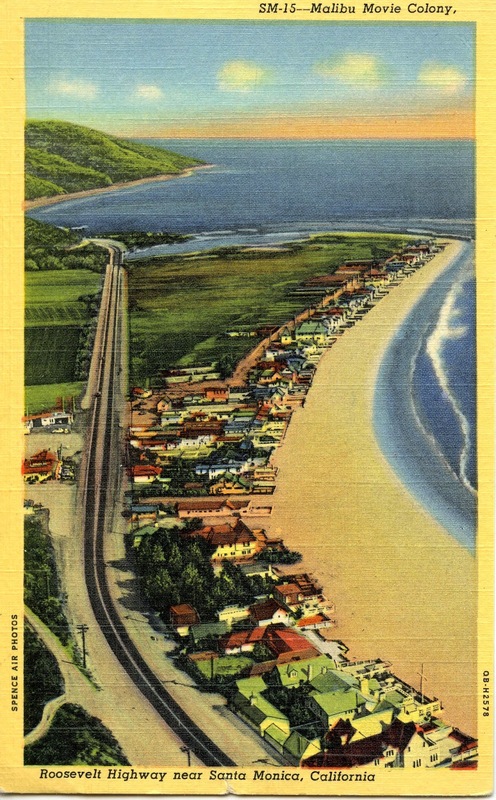 While much of the most egregious destruction occurred before the community incorporated as a city, we’ve allowed developers to bulldoze and demolish our heritage—Chumash sites, ranch-era buildings, WW II history, mid-century modern architecture, and natural resources, including ocean views, open space, ridgelines and trees. One great oak in Ramirez Canyon, of massive size and great gnarled trunk, we call Abraham’s Oak, in remembrance of the ancient oak in Palestine of the same name, so called because it was thought to have lived in Abraham’s day. Many the time have I wished that grand old oak to make me his confidant and revel the secrets of the past. In Soston [Solstice] Canyon about twenty-five young oaks are growing close together, and their tops blending in foliage make a great umbrella-shaped roof, a fine house. The birds love these trees. In Trancos [sic] Canyon I know a noble oak whose boughs almost reach the ground, and on all the branches, even the lower ones, within your reach, are scores of nests. It is really a compound bird-nursery. None of these trees are there now. It isn't as grand a tree as Rindge's "Abraham oak," but this Ramirez Canyon tree is one of the surviving canyon giants. When I was a child this oak stood at the edge of a horse paddock, and was the subject of many tall tales, ranging from ghost stories to wild west hangings. It is now in a flowerbed island surrounded by pavement at the entrance to a mansion, but at least it is still standing, proving that solutions can be found. Trees are a lot easier to cut down then they are to grow—hundreds of years of living history can be obliterated in minutes with a chainsaw. The sycamore isn't the only tree scheduled for demolition on PCH at the lagoon. Part of the row of 70-year-old eucalyptus trees that for more than three generations have provided shade for surfers and other beachgoers parked on PCH are headed for the chopping block. Like the sycamore, you can trace their history in the aerial photography record. 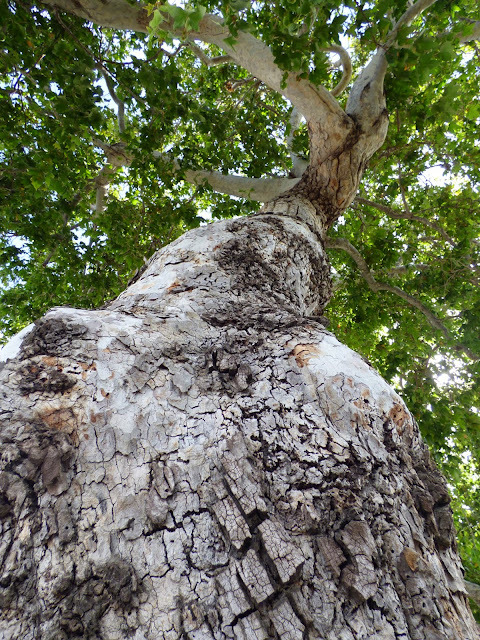 Unlike the sycamore, they aren't native trees, but they are large and old and picturesque. 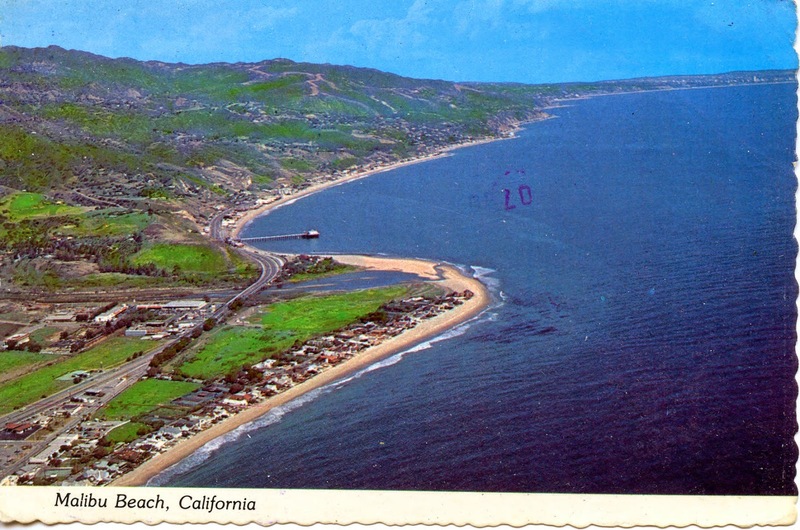 A postcard from the late 1950s shows the sycamore and the row of eucalyptus trees, front and center, part of "Malibu Beach" history, soon to be history if Malibu residents don't speak out. This image is also from Pepperdine University's stellar digital archive. I'll miss them when they are gone. The surfers will miss the access to free parking underneath them, along the stretch of highway closest to the Malibu Lagoon State Beach entrance, which apparently is also going to be a casualty of this project. The trees and many of the surfers' cars will have to go if the developers get their way. The surf was up the day I took this photo and cars were double and triple parked all along this stretch of PCH. The road widening project may or may not help with the traffic situation in the Civic Center area. It would be nice if the plan could be completed in a way that doesn’t require the destruction of the sycamore or the eucalyptus trees. 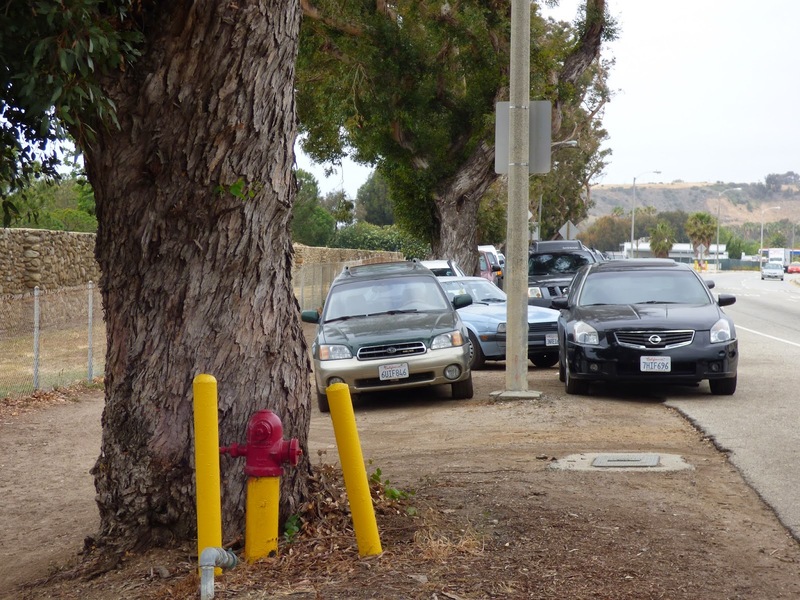 It will be unfortunate if the trees are removed and the city decides to adopt the Civic Center Design Standards Task Force’s idea of making the traffic on Civic Center Way and Cross Creek one way only, negating the necessity for the removal. This postcard from the late 1940s shows the row of eucalyptus trees just a few years after they were planted. Aerial photos from 1944 show no trees except for the sycamore, by 1947, the trees are clearly visible. A post WW II date like 1945 sounds reasonable for the year of planting. That would make them 70 years old today. It’s depressing that developers continue to have the financial leverage to push ill-conceived projects through, while environmental and conservation activists struggle on shoestring budgets. It would undoubtedly be a better world if developers and their investors could learn to care about more than the bottom line, but it probably isn’t realistic to expect some kind of epiphany, not when the "apostles" preach the gospel of "iconic brands" (what does that even mean?). However, it is still not too late to save the trees. The Planning Commission hearing on this phase of the project is scheduled for June 2 and the public comment period is open until May 21. The entire document is available here. Many of us who love Malibu see it as the Professor saw Oxford, as "an oasis of sanity in a desert of unreason." Some days it feels like that desert is encroaching on us despite all of our efforts to hold it back, but that doesn't mean we can't keep fighting for the things that are important. Excellent article Suzanne Guildimann, this really makes the case for historic preservation.Not simply tree-huggers, Malibites need to protect our history and be able to inform future generations. Make a difference by standing up to protect this tree. This is our Responsibility to the Environment, this micro-universe that gives us so much pleasure and deeply feeds our lives.